In the late '70s, Todd McFarlane created a blue-clad sci-fi alien hero named "Spawn"; in the early '90s, he reintroduced Spawn as a a horror character in red. Perhaps it's simply a coincidence, but right in between those two, he worked on "Batman: Year Two," the 1987 story which introduced The Reaper. Judson Caspian's alter ego; will his murderous crime spree force Batman to make an uncomfortable partnership with Joe Chill? The story that became "Year Two" was pitched as "Batman: 1980," but the success of "Year One" changed that. The story starts in the '50s, with a wealthy socialite donning a costume to exact vigilante justice on the criminals who killed his family - except it wasn't Bruce Wayne, it was Judson Caspian. Merrily stabbing juvenile delinquents with a scythe, Jud decided to hang up the cloak after getting stomped by Green Lantern, but when he saw Gotham City had a new vigilante hero he came out of retirement. Even at a glance, you can really tell how Reaper's design influenced Phantasm: he wears a big, hooded cape and conceals his identity behind a skull mask. 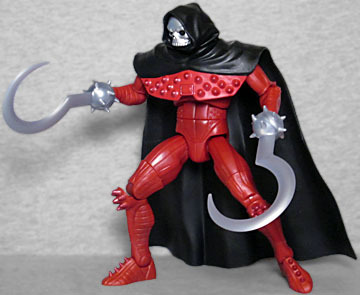 Of course, while the mask of the Phantasm was stylized, Reaper's is a more realistic sculpt. It's silver, and lacks a lower jaw, but it looks like a real(ish) skull. Of course, while Phantasm just wore a featureless black bodysuit, Reaper is in a full-on "Gary Oldman in Francis Ford Coppola's Bram Stoker's Dracula" suit of armor. It's bright red and seems to be made from thick leather (since lightweight metal bodyarmor wouldn't have been available in the '50s) shaped to resemble exposed muscle tissue. You've got to give Alan Davis credit: he designed the costume, and going for something skeletal would have been the easy, obvious choice, but a character who looks like he's been flayed definitely keeps the "deadly" theme going. The chestplate is molded as part of the cape, so it tends to "float" away from the body a little bit, but that's not inaccurate to the comics, really. And for once, the figure doesn't have that weird flat-fronted crotch that so many Mattel DC figures have had for years! The articulation is actually a little better than Mattel usually delivers! Reaper has a balljointed head, swivel/hinge shoulders, swivel biceps, swivel/hinge elbows and wrists, a hinged torso, swivel waist, swivel/hinge hips, swivel thighs, hinged knees, and hinged ankles. There have been a few DC figures with swivel/hinge wrists before, but they usually just stick us with plain swivels because they're either cheap or lazy. The costume is festooned with spikes (nb. the Spawn influence), particularly on the chest, but also on the elbows, knees, and the tops of the feet. The spiky pads on the knees are molded as part of the lower leg, as they should be, but the elbow pads are part of the bicep, when it really feels like they should have been molded on the forearms instead, allowing them to move when the arm bends. Reaper's weapons of choice were a pair of handheld scythe things with spiked baskets that cover the entire hand. Since that would be hard to do in action figure form, the toy's hands pull out of the sockets, and can be replaced by the two included accessories. 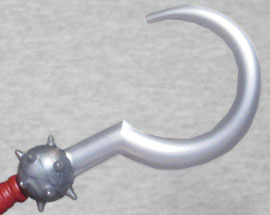 The weapons are molded from pale silver plastic and not painted, which means you can see the swirls in the plastic. The ones in the comic could also shoot bullets or create smokescreens, but these don't do that. On the plus side, you can hook the blades over the big peg that holds his cape on, which simulates the way the things could be holstered in the artwork. 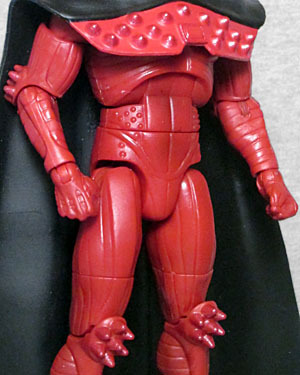 This figure is part of the same series as Duke Thomas, so it also comes with a piece of the BAF batbot: the chest. Which appears to be compatible with the Jim Gordon heads, and definitely makes me more interested in building the whole figure than I have been up until now. Other than Phantasm, Reaper has never showed up outside comics - not in any of the cartoons, not as an Easter egg reference in the Arkham games, nothing. He hasn't even made it into the HeroClix game, and they make everybody! There are HeroClix figures that don't even have Funko POP!s, for crying out loud! This figure right here is the first piece of Reaper merchandise ever made. 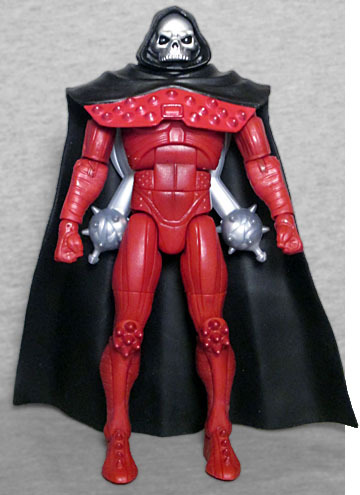 He's a super obscure character from a story that would probably be forgotten entirely if not for the Todd McFarlane connection, but Mattel did better than their usual halfassed effort on him.